Do you want to make today better in an instant? 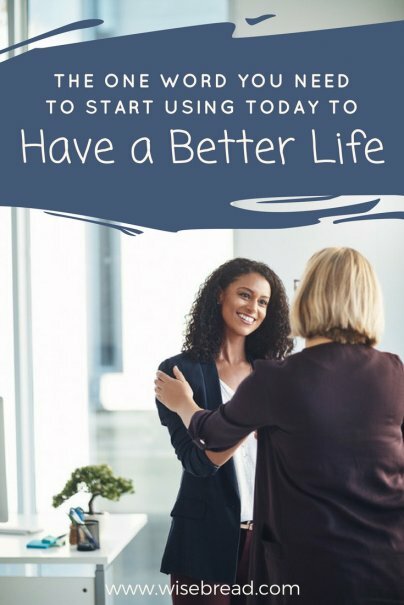 How about making the rest of your life better? Look around you, find something you're grateful for, and express that in one word. You don't have to thank a deity. Just saying the word "Thanks" can help you focus on the things that are good in your life — the ones for which you are thankful — which can improve your overall outlook. I've talked before about how words have power. The words we use can affect how we think about things like our feelings as well as how we process abstract concepts, like time and direction. They change how we remember and what we deem important enough to store in our memory. Given that words have the power to shape our experiences and how we think of them afterwards, it makes sense that we could use them to make our lives better. It also makes sense that some of them would be more suited to this purpose than others. As it turns out, "Thanks" is one of the very best ones out there. There are several reasons why "Thanks" is just the word to make life better. If you're not feeling great about your life, chances are that you do not have a positive outlook. You may not be intentionally focusing on the difficult parts of your life, spending a lot of time and attention looking at what's wrong. When you say "Thanks!" you are choosing to look at something that's right. Even if you only say it to your barista in passing, you are noticing a good thing and marking it verbally. Over time, saying "Thanks!" can help you replace negative thinking with positive. In order to say "Thanks!" we have to have our minds focused on the present. That is, we have to be mindful of the present. We have to focus on what is going on here and now, on what other people are bringing into our lives, or on what we already have. Thus, saying "thanks" is one way to develop mindfulness. Some people achieve mindfulness via meditation, but sticking with a meditation practice requires time and energy, which you may not have if life is stressful or otherwise difficult. Because saying "Thanks" is something that you can incorporate throughout your day, it is a road to mindfulness that you can follow anytime, anywhere. Mindfulness increases the density of grey matter in the brain, improves the ways we process pain and difficult or strong emotions, helps us know ourselves more realistically, helps us feel better about our close relationships, improves our ability to focus, helps us lose weight, and more. If mindfulness offers all of that and saying "Thanks" is a way to bring us to that state, it's certainly a habit worth cultivating! Saying "Thanks," cultivating gratitude, whatever you call it, makes you more likely to help other people, even when helping them offers little to no benefit to you, or even causes some detrimental effect to you. When you are thankful for what you have, it seems that you are more willing to give other people things to be thankful for, too. Helping others, incidentally, is linked to greater health and longevity, less depression, and a greater sense of self-worth. And it can all start with the simple act of saying "Thanks!" If you're convinced that saying "Thanks" can improve your life, here are some strategies for adding it to your vocabulary. When you're first working to say "Thanks" more often, it will help you to decide to do it ahead of time. For instance, if you know you'll be stopping for coffee, take a second to think consciously about thanking the barista who takes your order. Even go as far as to envision it happening. Then, be sure to actually say it at the coffee shop. This can help you get into the habit of saying a word that you're not used to using, or to imbuing it with a deeper meaning. The idea of making a list of things you're thankful for is at least a little cliche, but it's popular because it works. If you're not the type to remember to stop and write down things you're thankful for on a daily basis (I'm not! ), set aside some time each week to list a few things. Or, you can put a small section into each day of your calendar, label it "Thanks," and list things as you go through your day. Take the time to say "Thank you" for each thing, even if it's only silently, and you don't know who you're talking to. Take some advice from a gratitude expert. Think of someone in your past who you would like to thank. This can be for anything, from a small kindness to having a great influence on you. Then write them a letter, telling them exactly what you remember and why it meant so much to you, and maybe why you remember it today. Try to meet with the person (or call them, or at least find their mailing address), so you can give them the letter or share it with them in the most personal way possible. Give yourself a little treat when you remember to say "Thanks!" This doesn't have to be (and probably shouldn't be) anything too big, but rewarding yourself notes your achievement and takes it seriously. Even if you just draw yourself a smiley face or get to cross off "Say Thanks" in your planner, the reward will encourage you to continue the habit. Any other transformational words — besides "thanks" — you've recently added or wanted to add to your vocabulary? Please share in comments!